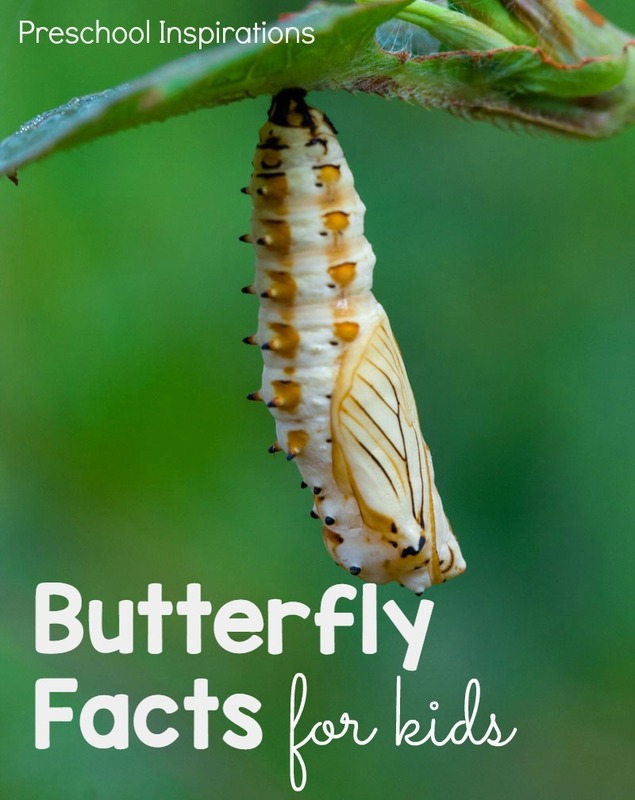 These fun butterfly facts for kids are a perfect way to teach children about caterpillars and butterflies. Learn about the butterfly lifecycle, caterpillar facts, chrysalis facts, a butterfly’s lifespan, how the butterfly tastes, and more! 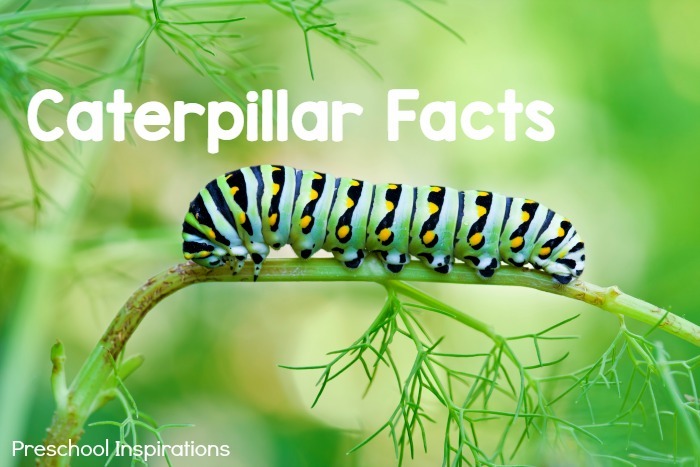 These facts are perfect for an insect or bug theme, and especially when children are naturally interested in caterpillars and butterflies. I also have some fun ladybug facts and spider facts you can use as well. The life cycle of a butterfly has 4 steps: eggs, caterpillar (a.k.a. larva), pupa, adult. 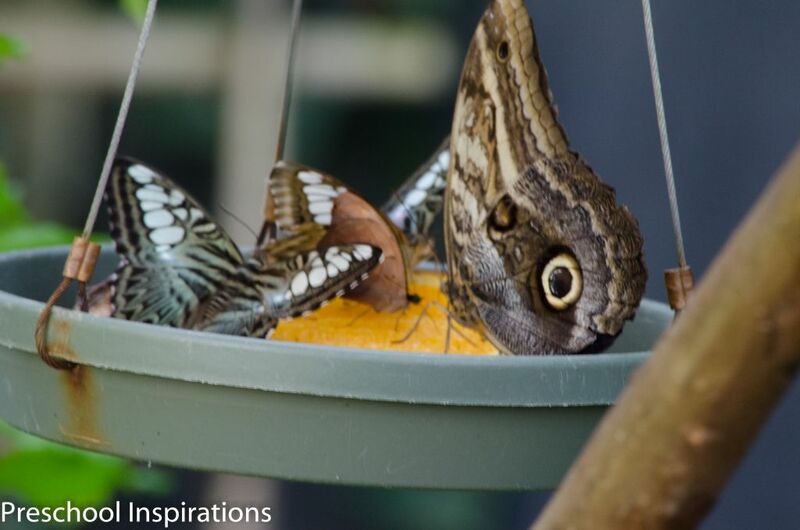 Most female butterflies lay their eggs on the kinds of plants their caterpillars will want to eat – this helps make sure the young are able to start eating right after they hatch. Otherwise, they will starve. Some butterfly eggs hatch in a few days; others in a few months. The average is 8 days. Only 1 in every 100 eggs survives and hatches; the rest are eaten or killed by disease. Caterpillars usually begin by eating their own egg shell. As it eats, and eats, and eats the caterpillar grows. It becomes too big for its own skin and has to shed or molt the old skin. Some swallowtail caterpillars make tents out of leaves for shelter. When a caterpillar reaches full size, it will molt to reveal a soft new body called a prepupa. The caterpillar spins silk and attaches itself to a twig or stick. His new soft body will harden to form a chrysalis. 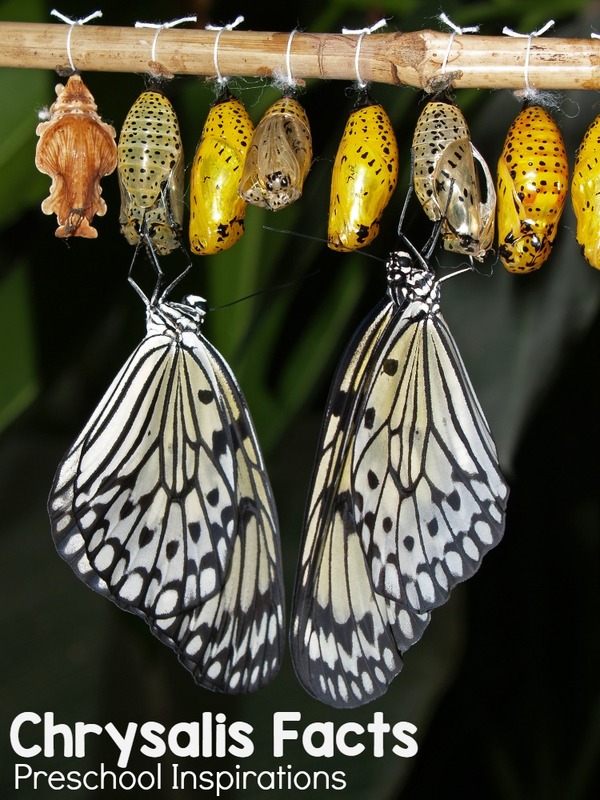 Inside the chrysalis, the pupa changes into an adult butterfly. This transformation can take a few days for some kinds of butterflies or up to a year for others! The chrysalis will crack open when the adult butterfly is grown. Butterfly wings are soft and crumpled when they first emerge from their chrysalis. They have to pump blood into them and wait for them to harden before they can fly. Some butterflies hibernate during the winter – in caves, under leaves, inside houses, and other safe places. 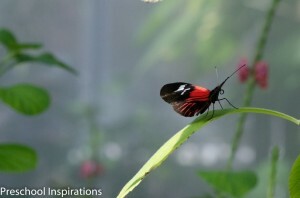 Adult butterflies can live from a week to over a year, depending on the species. In North America, thousands of monarch butterflies migrate 1,800 miles each fall to spend the cold months on the coast of California or in Mexico. They travel about 80 miles per day! For protection different butterflies use different defense mechanisms: camouflage, bad taste and smell, mimic the look of those that taste bad, “eye spots” or wing patterns to look bigger. Some caterpillars even have spots that make them look like snakes! The color on butterfly wings are from thousands of tiny scales. There are about 17,500 named species of butterflies. You would have to find 10 different kinds a day for 3 years to come close to seeing them all. Butterflies flap all its wings at the same time at about 5 beats per second. A butterflies “tongue” is called a proboscis. Some sip flower nectar, tree sap, or salts and minerals from damp soil and puddles. Others may drink the liquid from decaying fruit (and even animal droppings!). Butterflies “taste” with their front feet! The Queen Alexandra’s Birdwing is the largest butterfly in the world (and one of the rarest). Its wingspan can grow to 11 inches! The smallest butterfly in the world is the pygmy blue, with a wingspan of 0.5 inches. Butterflies around the world are in danger and some species have already become extinct due to the destruction of their habitat (home environment) and loss of food plants. Another reason is that butterflies are caught and killed for collections and to be sold in displays. We are doing a butterfly garden this year. So many of these will go perfectly with that! A butterfly garden sounds amazing, Jill!! I bet you all will have such an incredible learning experience :).